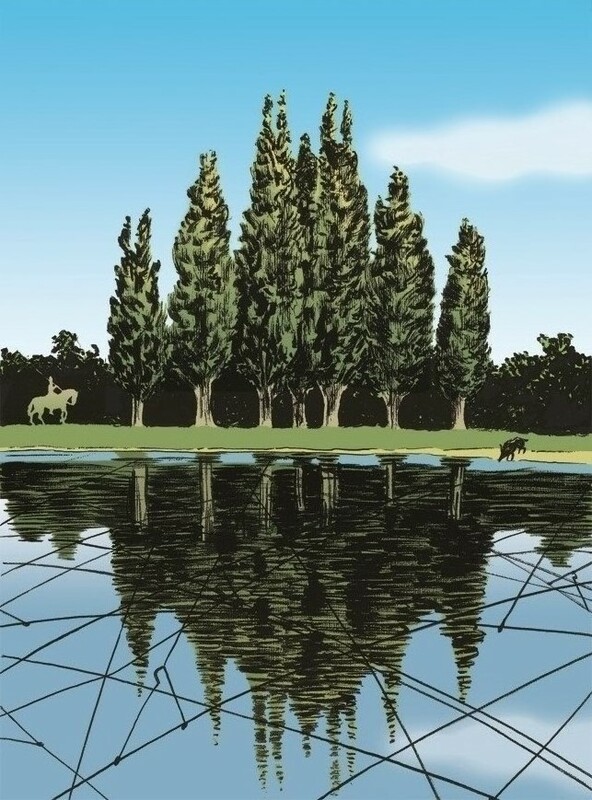 The image represents a row of poplar trees at the edge of a river –a common sight along the banks of the Po River and its tributaries, including the many waterways that once flowed through what is now the metropolitan region of Milan. The rows of poplars are reflected in the water, where they form a reverse image of the façade of the Duomo, Milan’s most iconic structure. Also reflected in the water are the electric wires of the Milan tram system, which crisscross the modern Milanese’s view of the sky from street level. On the right side of the image, along the riverbank, a wild boar has come to drink. The wild boar was the tribal totem of the Aedui, one of the original Celtic peoples who are said to have founded Milan, and a woolly wild boar sow (the scrofa milanuta) was an early symbol of the city. In this image, the wild boar stands as an embodiment of the primeval wilderness of the Po valley. The approaching rider on the left with a spear resting on his shoulder is a hunter with his sights on the drinking boar. The depicted encounter can therefore be interpreted as a condensed manifestation of mankind’s destructive tendencies regarding nature. Taken as a whole, this image of the “Poplar Duomo” recalls the forest, sacred to the Celts, on which Milan is built, and the linkages and disconnections between the modern-day city and its natural heritage. This entry was posted in comics, illustration, maryse daniel and tagged celts, duomo, fumetti, medhelan, milan, milano, pioppi, poplars, star comics. Bookmark the permalink. Your entry would doubtless have received my enthusiastic vote. A truly poetic image to match its poetic design proposal. Brilliant work, Jools! You should be proud, regardless. Needless to say, I am!